"We are now planning our next trip back to India, having truly fallen in love with this lively, colourful and spiritual country." They travelled with Exoticca in July of 2018. Phenomenal trip & excellent value for money! My husband, John, and I had recently returned from a trip to Kerala in February and we couldn’t wait to get back to the colourful country of India again, after having such a wonderful experience on our previous trip. 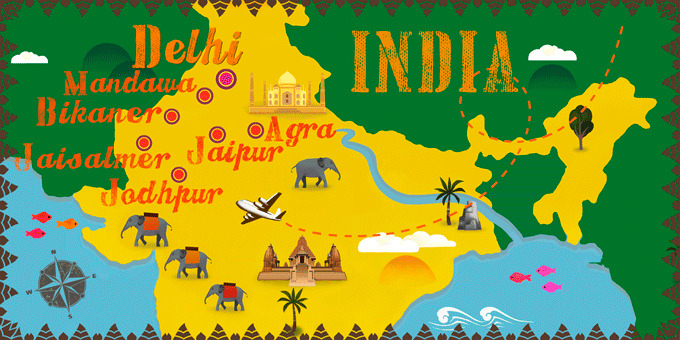 We wanted to swap the lush terrain of the south of the country for the varied cities and deserts of Rajasthan this time, so when we saw the offer on Travelzoo we booked straight away and began to look forward to the second trip to India in the space of 4 months! We almost always opt for holidays that have an element of adventure and exoticism to them. We don’t want to sit on a beach all day! We’ve spent a lot of time in the States in the past, having had a house in Texas for a number of years and also travelled to many other destinations over the past 20 or so years but India was quite new to us and it seemed this year was our year to discover it! If there’s one thing to keep in mind when you travel to India it is that you can never know what to expect. We knew it was going to be a whirlwind and we were excited at the prospect of getting to grips with the ‘real India’ this time around. We were met by our guide as soon as we got to Delhi airport and as we stepped outside we were struck by the absolutely manic atmosphere of this vibrant city. The sights, sounds and smells were out of this world. 13 million people a day commute into Delhi and it seemed as though each and every one of them was struggling their way through the immense traffic, dodging past cows, camels and even elephants. It was an amazing sight which reminds you just how far from home you are. 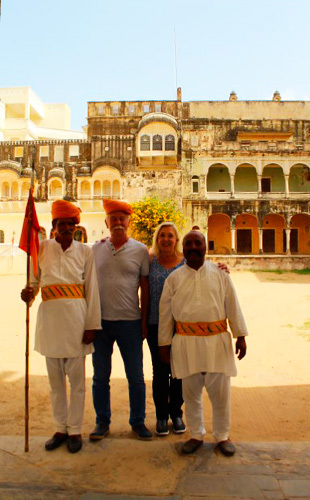 As we journeyed across Rajasthan, exploring many cities and towns along the way, we found our local guides to be extremely personable and interesting and they really made the trip unique, always adding personal insight and making us feel at home in India. The itinerary is action-packed, which is how we like it, but it is something to keep in mind if you’re used to a more laid-back type of holiday. The journeys often take longer than expected because you pass through some very remote villages where the roads are very basic or are barely there at all, but on the plus side I really felt that we saw the ‘real India’, and the way in which the majority of the popular actually live, away from the cities. The landscapes certainly made up for the time spent on the road and we were amazed at how different this part of India was to Kerala, where we visited just a few months earlier. It’s also nice to have time to reflect on all the wonderful things you’ve seen so far. Everything ran smoothly in regards to timings and organisation and we were lucky to have the guide all to ourselves as we were the only two in the group, meaning we gained a lot of insight into the culture. The guides shared lots of their experiences with us about life in India, for example, one of the guides explained all about his arranged marriage, which I found fascinating. 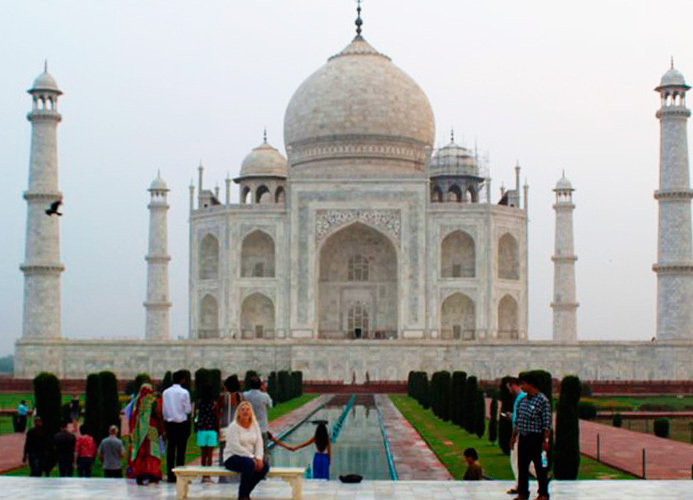 Sandra at the Taj Mahal. Of course, one of the highlights of travelling around this part of the world is the abundance of amazing temples, palaces and forts, of which we visited many! The Taj Mahal, as expected, was amazing and it feels good to have ticked it off of our list but some of the lesser-known sights were just as, if not more, amazing! The Red Fort in Delhi, a former palace of the Mughal Emperors, was phenomenal and literally the size of a small city. We’d never heard of this place before but it blew us away with its decorative motifs and its size. Another memorable visit was to a Hindu temple. We knew very little about Hinduism but the half an hour or so we spent on a tour of the temple really opened our eyes to the religion and we got to see the worshippers going about their daily rituals. The strangest experience we had during our trip was when our driver took us to the Karni Mata Temple, near Bikaner. We had no idea to expect and it turned out to be a temple inhabited by 25,000 black rats, who are considered the holy descendants of the Hindu Goddess of War! We took off our shoes and put protective bags on our feet to enter the temple as the thousands of rats ran freely around the rooms. It was certainly a unique and fun experience and it is fascinating that many pilgrims visit these holy rats every year as part of their dedication to their gods. If anything, it gave us an amusing story to tell our friends when we got home! We also enjoyed a couple of visits to some of the local workshops and factories. We visited a traditional Rajasthani carpet factory and an amazing gemstone workshop, which really highlighted the incredible natural resources of this part of the world. After experiencing so many different things during our visits and sightseeing tours, we were pleased to return to the wonderful five-star hotels every evening. The accommodation across the different locations was a good mix of old and new but our favourite was the Haveli hotel in Bikaner. It offered an incredibly authentic experience and it was an absolutely beautiful building. The staff in all the hotels helped to make our stay memorable and special. At one of the hotels, the waiters at breakfast offered us special options when he thought we were having a hard time choosing from the buffet! We had opted for the half-board package, on the advice of one of the travel experts at Exoticca, and we were so glad we did. The buffets were always so varied and abundant; the one on offer at the Jaypee Palace was outstanding. Everyone we came across in India was very friendly and welcoming. As a lady with blonde hair, I became quite the novelty for many Indians, who have rarely seen a blonde in real life. I must have had my photo taken with hundreds of people who were always so polite and genuinely intrigued by me. It was nice to connect with all of these people from different backgrounds and cultures. I feel like this trip, being so action-packed, offered you a month’s full of experiences in just 10 days and we came home with a sense of having learnt so much about the culture, the people and also about Hinduism and the customs and curiosities of India. We are now planning our next trip back to India, having truly fallen in love with this lively, colourful and spiritual country. Many of the guides work for quite a small wage and it is respectful to tip them well as they really make the experience special. Save yourself the hassle and just pack comfortable clothes for travelling and sightseeing and a few nice outfits for the wonderful dinners at the hotels in the evenings. We are so glad we upgraded and added our dinners on as sometimes there are not many places nearby for evening meals and you might be tired after a long days sightseeing.